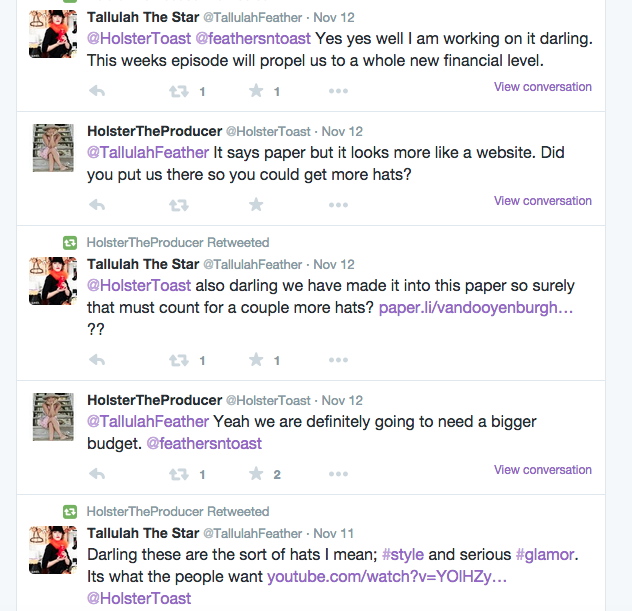 We figured if Tallulah has her own web cooking show, then her lack of trending status would surely be her biggest obstacle to gaining all the success, acclaim and hats she desires and it was Holster’s job as Producer to remedy this. 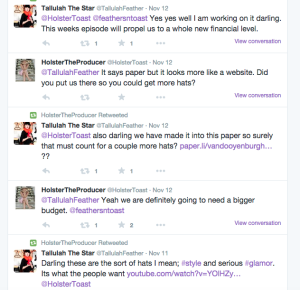 The trouble was, Holster and Tallulah had very different ideas about what type of content would cause that success. 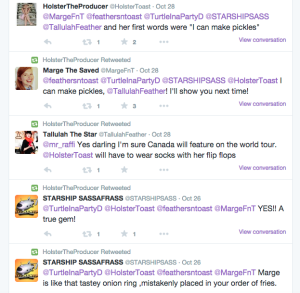 Holster felt Tallulah needed a popular co-host to help her stir up ratings, and lets just say Tallulah disagreed. We thought, “wouldn’t it be funny if Tallulah chose to have Marge on the show, because in her eyes Marge proves how important she is, after all she’s saved a life?” Tallulah figures this will get things moving, and give her the proper acclaim she deserves but in the end it backfires because Marge starts trending instead?” We knew this would bring out Tallulah’s green-eyed monster and add to all sorts of fun. So that became the plan. 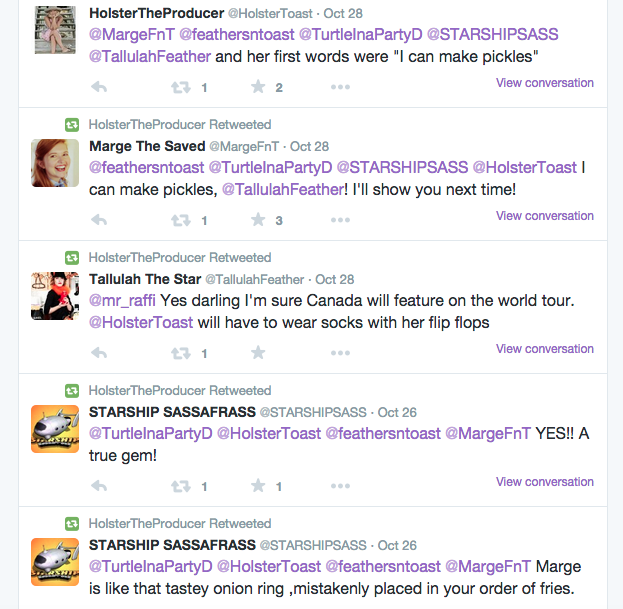 We took to the twittersphere and created twitter accounts for Tallulah, Holster and Marge and then as the episodes started being released we started tweeting. We had an awesome time tweeting back and forth in real time, in character, shared a lot of laughs, and even had quite a few fans join in on the fun, but in the end, as it turns out, you kind of need to already have a decent sized and engaged audience, for this kind of storytelling to really work. While we may not have succeeded in making Marge trend, we did discover how much fun Improving with our fans on twitter can be, so you can expect much more of this behavior in the future. In fact if you enjoy a little Improv banter yourself you can always feel free to chat with Tallulah and the gang by following and tweeting to these accounts Tallulah, Holster & Marge now. Which leads me to…. If at first you don’t succeed, try, try again. (cliche for a reason) Can’t tell you how many times this has proven to be true in this business. Persistence is everything. And without further ado, here is Episode 2 of Season 2, featuring the triumphant return of the newly trending Marge #SaveMarge (and yet another slam dunk performance from Tami Hillberry & Mhairi Morrison who have proven themselves to be one take wonders, with Improv no less.) 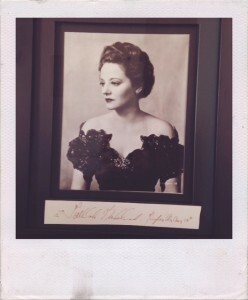 I love how Marge is suddenly dressed more like Tallulah, copying her every move. Little moments of genius, all found in the moment. 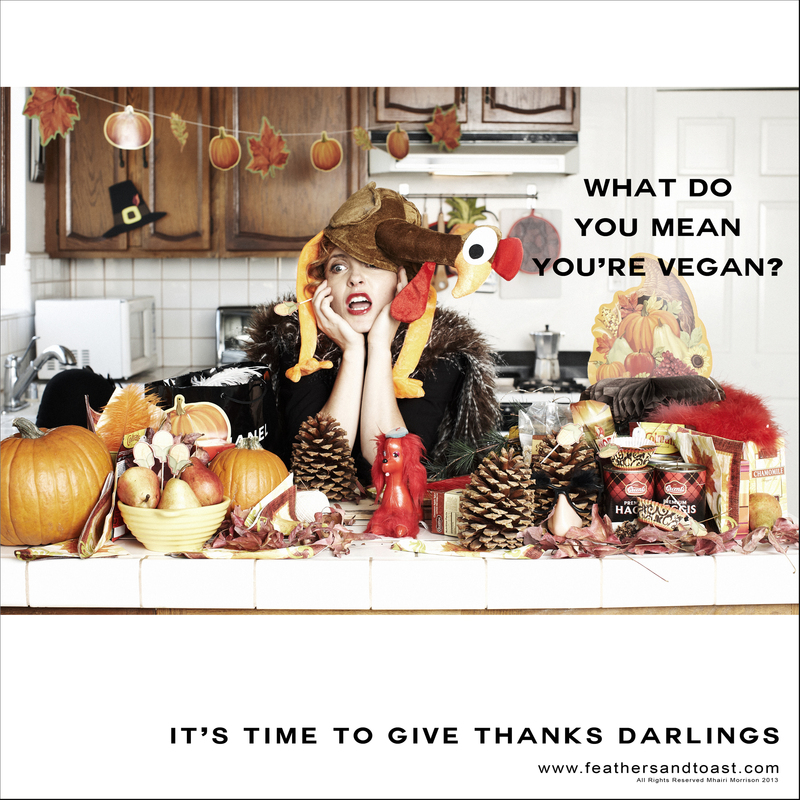 Following on from what Holly’s blog touched on the other day darling, this is my version of events.